Limera1n has been released for all iOS devices including: iPhone 4, iPhone 3GS, iPod touch 4G / 3G, iPad running iOS 4.1, and iOS 3.2.2 respectively. Limera1n is currently available for Windows only, however a Mac and Linux version will be available soon. 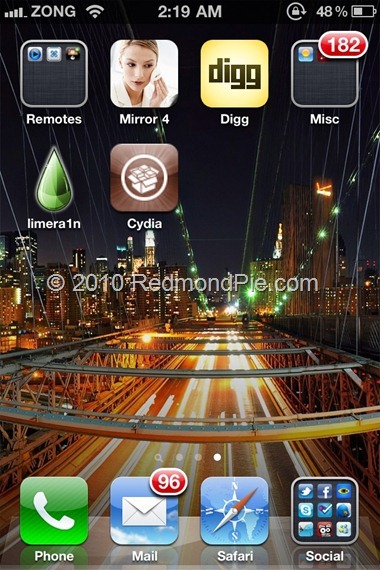 The following instructions will help you jailbreak iOS 4.1 on iPhone 4 and iPhone 3GS using Limera1n. NOTE: If you rely on an unlock, do not update to iOS 4.1 yet as doing so will upgrade your baseband, making it impossible for now to unlock. Either use TinyUmbrella to update to iOS 4.1 without update baseband (instructions here), or wait for PwnageTool which will help you cook custom firmware files for iOS 4.1 without the upgraded baseband. Step 2: Connect your iPhone via USB to your computer and click on “make it ra1n” as seen in the screenshot below. Step 4: Once you are done with this, you will have the limera1n logo on your iPhone’s screen. Limera1n will now inject the bootrom exploit to pwn your device forever! 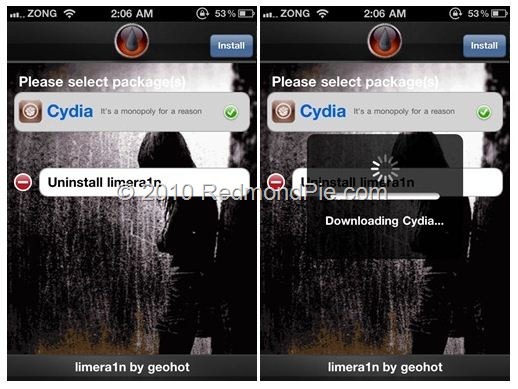 Step 6: Now start Limera1n app from your iPhone, and install Cydia as shown in the screenshots below. There is currently no way to unlock your iPhone on the latest 05.14.02 baseband. If you have managed to preserve your baseband while upgrading to iOS 4.1 using TinyUmbrella, you can use the existing version of Ultrasn0w to unlock your iPhone on iOS 4.1. Step by step instructions for unlocking can be found here. UPDATE 1: Follow the step by step instructions posted here to jailbreak iPod touch 4G / 3G on iOS 4.1 using Limera1n. UPDATE 2: Follow the step by step instructions posted here to jailbreak iPad on iOS 3.2.2 using Limera1n.